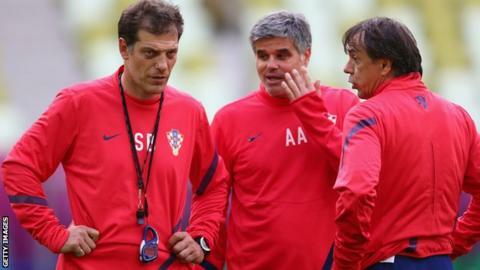 West Ham manager Slaven Bilic has appointed former Croatia team-mate Nikola Jurcevic as his new assistant. Jurcevic worked under Bilic at Croatia, Lokomotiv Moscow and Besiktas. Bilic confirmed after his arrival in June that he wanted to appoint Jurcevic, but the 49-year-old had to wait for a work permit, which he has now received. "I am very happy that I can start work. Slaven called me about West Ham and I said yes straight away," he said. Former midfielder Jurcevic was capped 19 times and made his debut in Croatia's second-ever fixture against Romania in December 1990. Both he and Bilic were also part of Croatia's Euro 1996 squad. As manager and assistant, the pair helped the national team qualify for Euro 2008 and 2012.